Tuck Pointing, Brick and Chimney Repair Toronto | Turnbull Masonry Ltd > Blog > Blog > Should You Lay Your Own Brickwork Or Hire A Professional? DIY (do-it-yourself) projects are all the rage right now, but some projects are best left to the professionals. 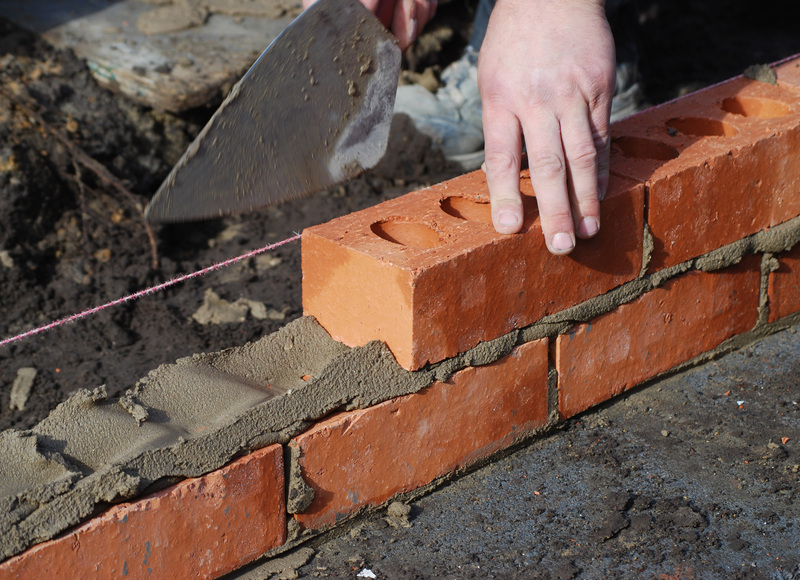 Many people often ask if they can lay their own brickwork, and if so, how is it done? It might look simple enough, especially considering the techniques for laying bricks have been used for many years. But before you take on such a hefty project, it’s important to understand some of the finer points on how to lay bricks properly. Here we provide a brief overview of how to lay bricks. Plus, two questions you should ask yourself in order to determine if you should build your own brick walkway or structure, or hire a professional. If you want to lay bricks on your own, the first thing you need to do is protect your own safety. Working with mortar requires the use of proper gear, like nice thick gloves and a safety mask or respirator. Your goal is to stack the bricks just so, one at a time in order to achieve clean and straight lines. How well your bricks stack up will impact the sturdiness of the structure as well as the overall finished appearance. Purchasing certain tools is necessary in order to create straight lines, such as a mason line. Another helpful tool is a story pole, which can be used to mark the exact height of each layer, marked with a pencil as you go along. As you carefully stack bricks you will use a spade trowel to apply the mortar that holds everything together. You want to use a good amount of mortar, and you never want to use too little. Bricks need to be coated evenly and generously with mortar so that they are able to stick on the top, bottom, and sides. You can also use the trowel to shove the bricks firmer into place, and push out any existing air bubbles. Once complete, you want to remove excess mortar leaking out of the joints. You can then use a spade trowel, held at a 30-degree angle, to create lines between where the bricks meet with the mortar joints. This trick actually helps your brick wall withstand more environmental damages, such as moisture. While the majority of bricks can be purchased cut to size, the bricks on the corner of a structure need to be cut based upon the project, meaning you will have to cut them yourself. To do so, start by using a chisel and a hammer to make marks on all sides of the brick where it needs to be cut. Next, take the chisel and place it inside of one of these holes or slits you have made. With one strike of the hammer over the chisel, the brick should break into 2 clean pieces. When you do this, place the brick in a closed container with a nice bed of dirt so that the brick can better absorb the shock. Should You Lay Your Own Bricks? Sounds simple enough right? Think again. Many people think that bricks are easy to stack into structures, but without plenty of previous training it’s nothing we recommend trying on your own. Working with mortar makes things more difficult, messy, and even risky. According to expert opinions, you should never attempt to build a masonry wall that is over 4 feet tall on your own. And not just for safety concerns. If you attempt to take on a project like this yourself, the appearance of your brick wall might not come out how you are expecting. The precise way you lay bricks when building a wall will determine a number of things. For instance, bricks set lengthwise and placed in a staggered pattern create the strongest type of wall. Knowing all of your options and the best method for a certain project takes years of experience and accumulated knowledge. 1. Who Taught You To Lay Bricks? You can read all the books you want on bricklaying but reading can never compare to watching a professional do the work firsthand. Studying how it is really done with your own eyes will make all the difference in preparing you to lay bricks. If you have never watched someone lay bricks before, it is not be the best idea to try it yourself. 2. How Much Practice Do You Have Laying Bricks? It takes anywhere from 40-50 hours of practice before you are capable of building a wall that looks good and is structurally sound. That’s a lot of practice before you can build a wall in your yard that actually looks good and is built to last. Without this experience, the quality of your wall relies solely on luck. If you have not watched someone lay brick or don’t have much experience laying brick yourself, it’s not a good idea to lay your own brickwork. You might think you are saving yourself money, but you will likely end up spending more money in repairs, plus a lot of your time and energy. Leave the masonry work to the pros! Contact Turnbull Masonry for all of your needs, including brick restorations, repairs, and rebuilds.